I love this dress. I'm not normally a drop-waist sort of girl, but when I first laid eyes on this little number it was love at first sight. The material makes this dress actually work for me. If it were a stiff material it wouldn't fall where it needs to, but since it's so flowy/silky it doesn't create that typical box shape on me. Have I mentioned I don't wear drop-waists? I guess I stand corrected. Love it. I'm a fan of the drop waist. CUTE shoes!! and i love your hair! So pretty. Ohh, this dress is too pretty! <3 I love the bright colours - and you're right; the drop waist looks truly wonderful! 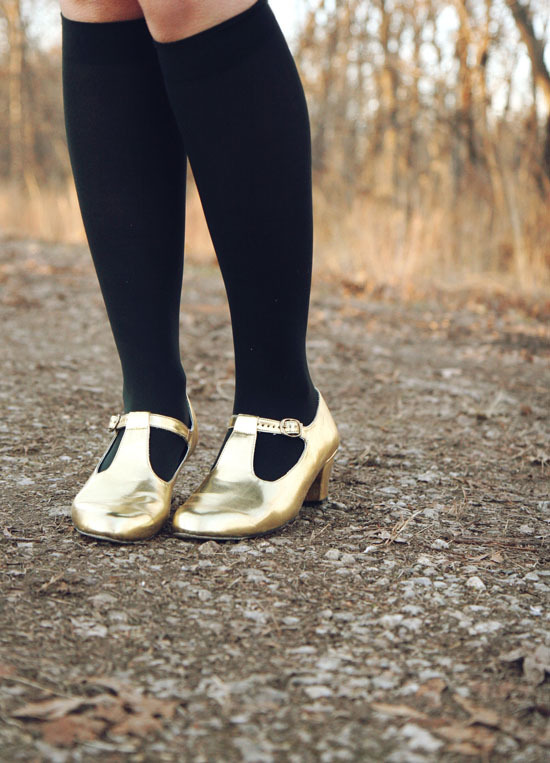 I adore your Golden Ponies shoes too - they make the best stuff! I have a Golden Ponies doctors bag which I use pretty much all the time! So cute Katie! Love your dress! Super cute! I am loving your shoes! Oh my goodness! SO lovely! You have the cutest style, Miss Katie! lovely dress, it really suits you so well! And those shoes, awesome!!! That dress is so pretty! Love it. It suits you perfectly. You should start wearing drop waists! drop waists are the hardest thing to wear---EVER. but you pulled this off, and i love it! The dress is cute on you, but I hear what you're saying about a drop waste! And those shoes? .. absolutely gorgeous. love your dress and amazingggg shoes! You look great!! I don't wear drop waists often either but that dress is perfect for you! I love that dress!! That pattern is beautiful as is the pretty drop waist! And those colors look perfect with your adorable red hair. dear katie, that pattern on your dress looks like an abstract painting! i can recall seeing in some museum, but i can't identify the artist or the name. this makes me think of the partridge family - and i love it sooo much!! eepp! 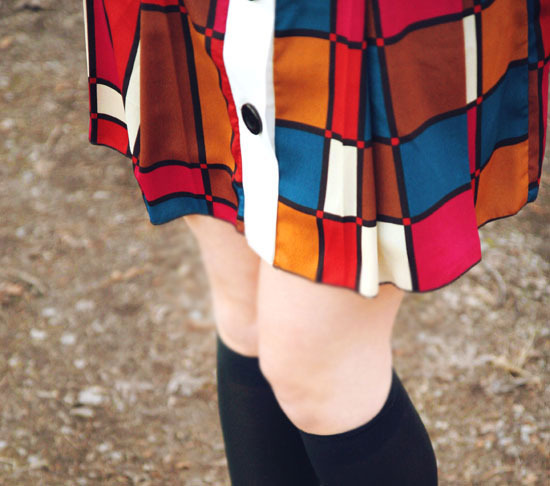 Love your dress and love your blog. It's gorgeous. I'm following now. Happy new year from Germany! I've been eying that dress for a couple of weeks now. After seeing it on someone and looking so great, I might have to break down and buy it! I love the shoes too! So cute! You always have the cutest dresses. This one may be my favorite. hehe...i bought this exact dress for myself over christmas and i love it even more in person than online! it's such a fun little number. you really look gorgeous in it! It is beautiful on you! I wouldn't normally try a drop waist dress either but maybe I need to look at the fabric first. dude, you and I both know that I need that dress. can I come to your closet and play dress up please? That looks gorgeous on you! The colors are beautiful with your hair color. man, I loved that dress but wasn't sure about the drop waist. It's so cute! Yes- like Mondrian made a guest appearance on the Partridge Family! I love this dress- but most of all, the styling is so perfect! Definitely know what you mean about the drop-waists but this one looks ADORABLE on you! I feel like watching The Partridge Family so badly now. I only have the first two boxsets though and this is making me want the third. Your outfit screams PARTRIDGE FAMILY!!!!!!! Love this!